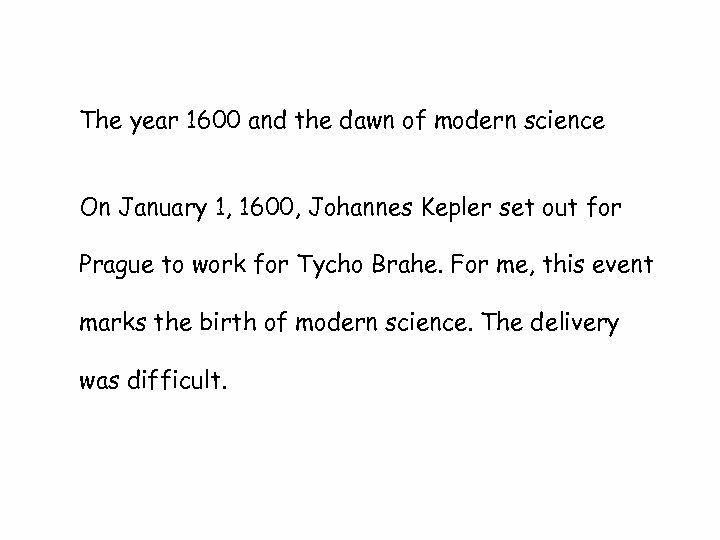 The year 1600 and the dawn of modern science On January 1, 1600, Johannes Kepler set out for Prague to work for Tycho Brahe. 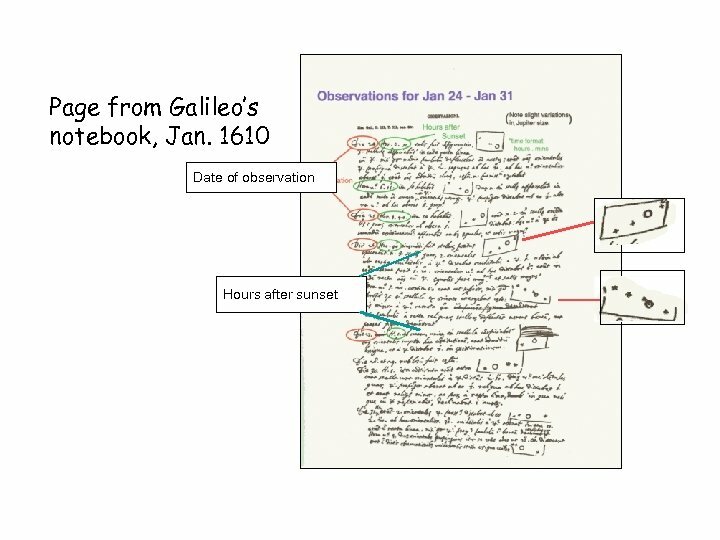 For me, this event marks the birth of modern science. 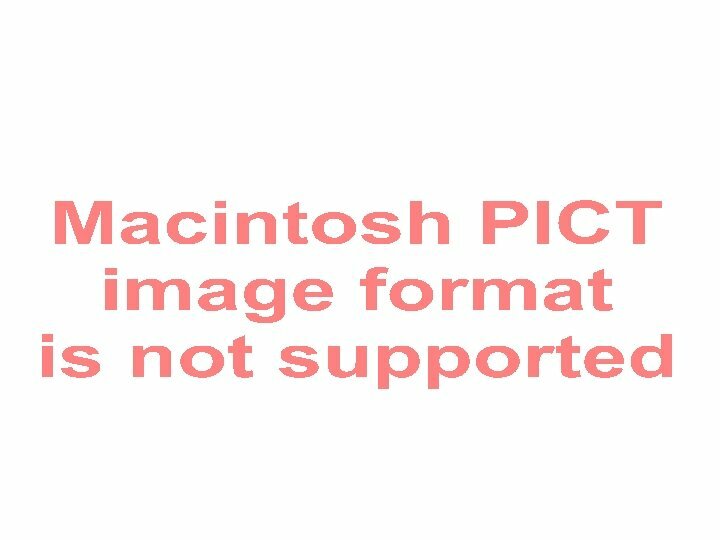 The delivery was difficult. 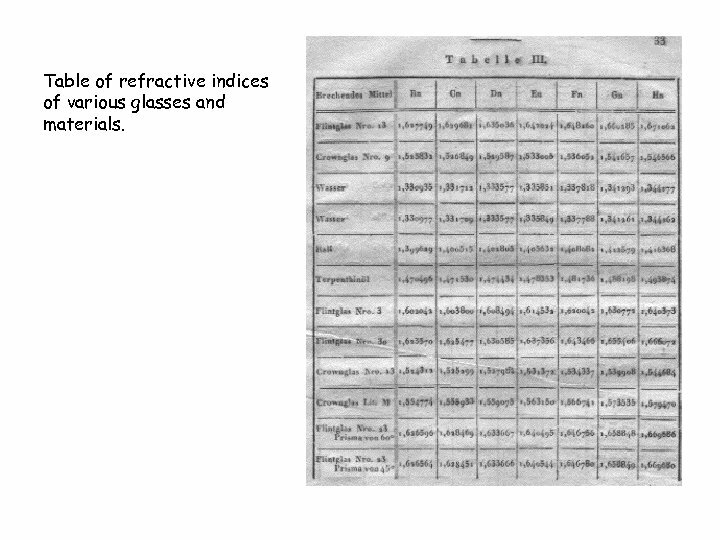 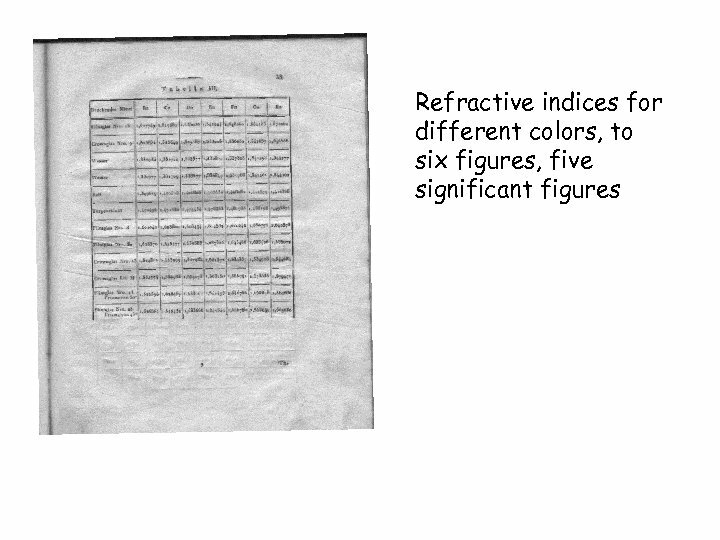 Table of refractive indices of various glasses and materials. 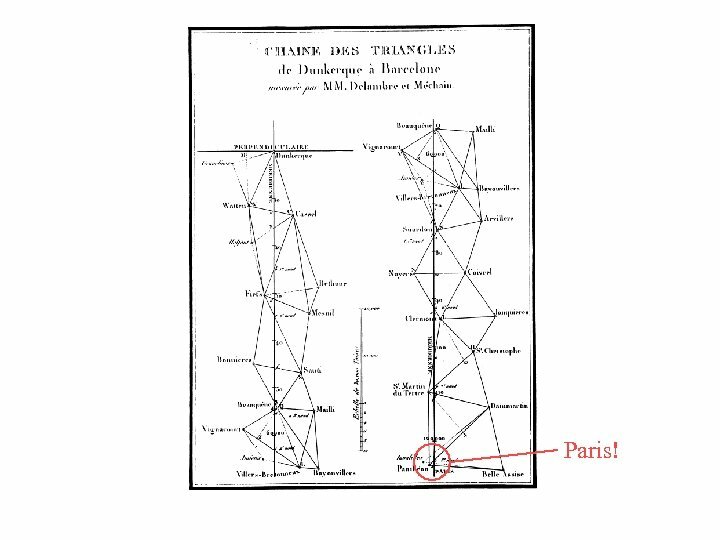 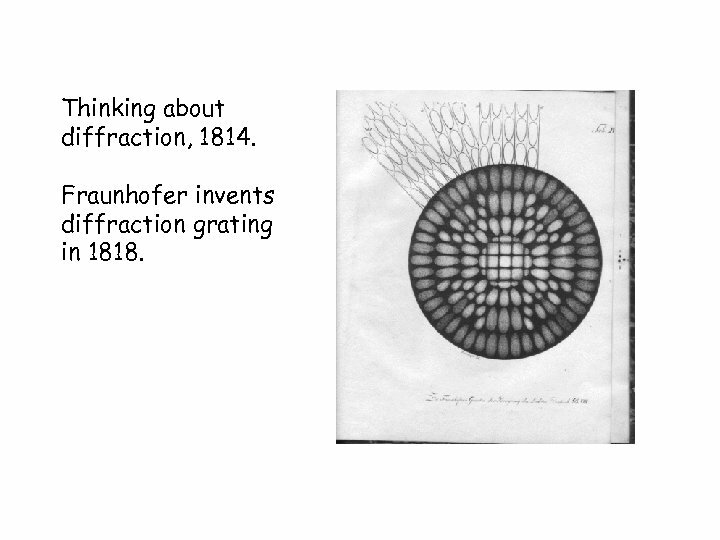 Thinking about diffraction, 1814. 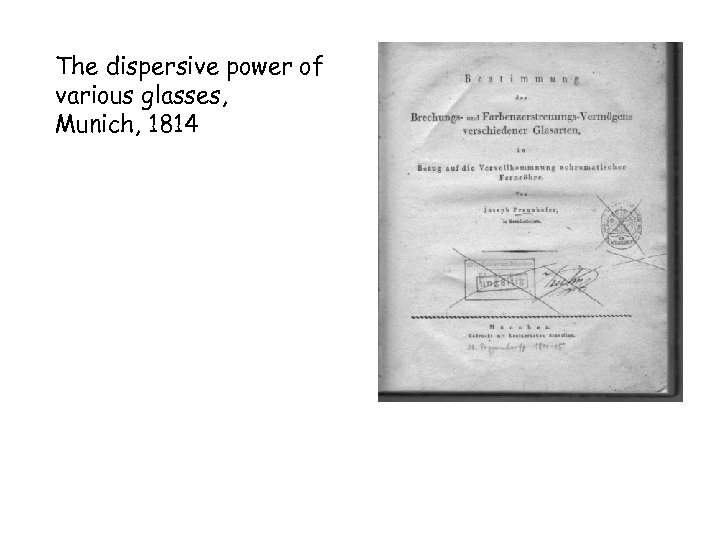 Fraunhofer invents diffraction grating in 1818. 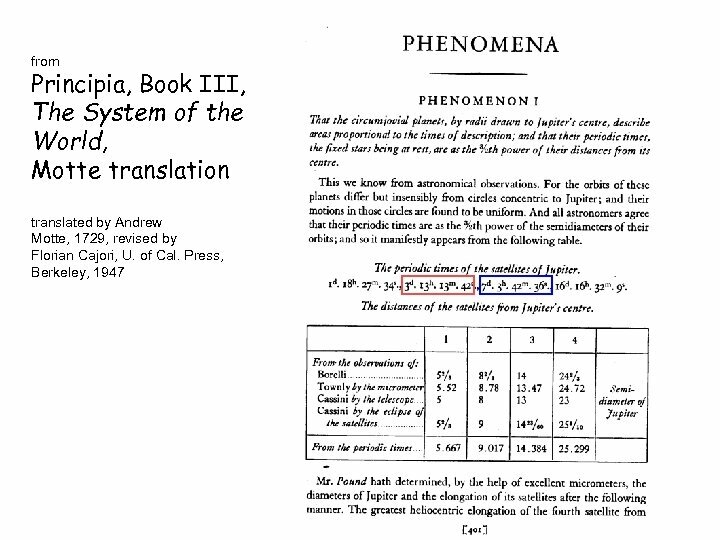 Directly following that paper, another. 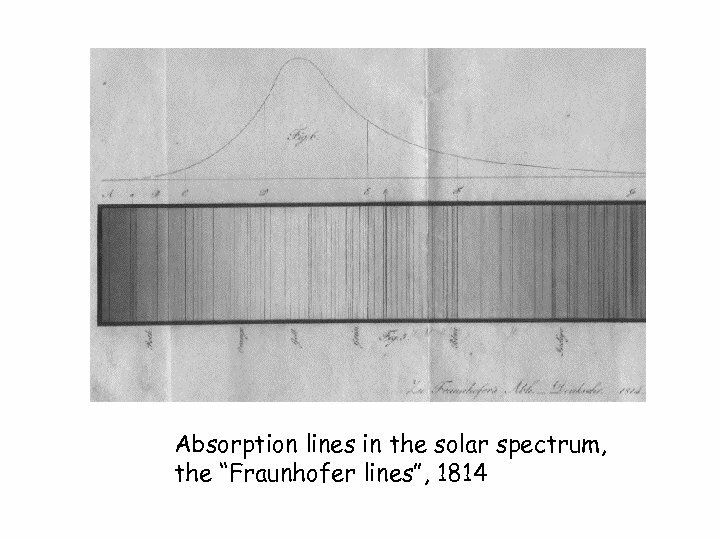 On a Method of making the Wavelength of Sodium Light the actual and practical standard of Length. 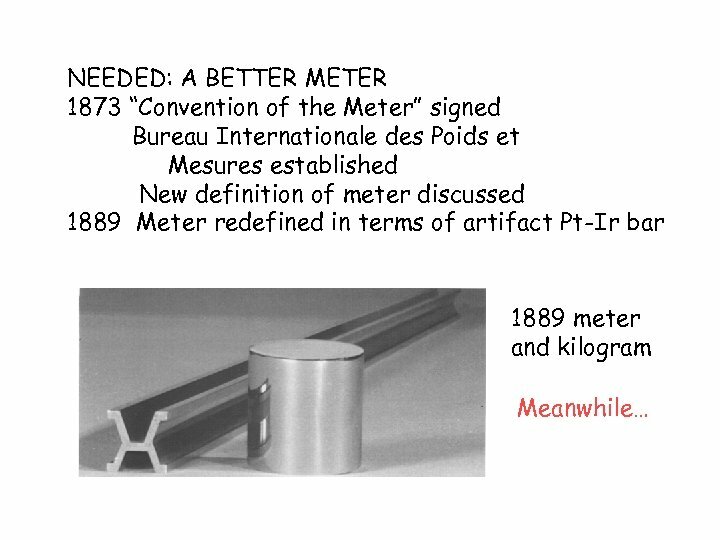 So, the 1889 definition of meter in terms of artifact was obsolete when it was adopted. 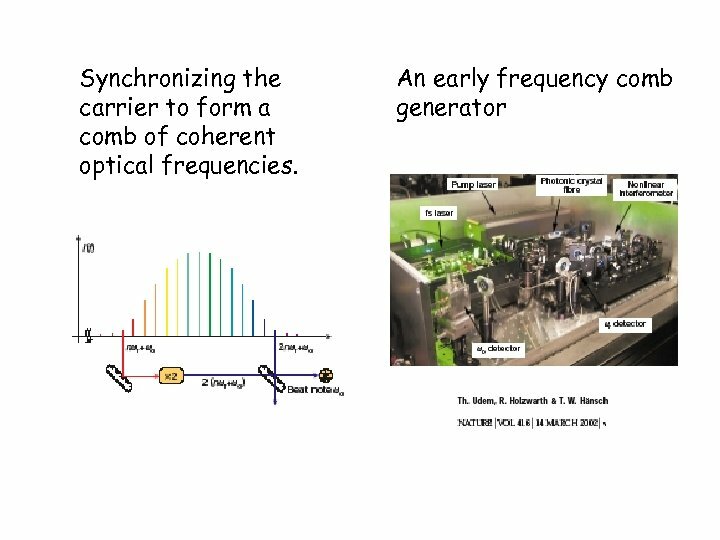 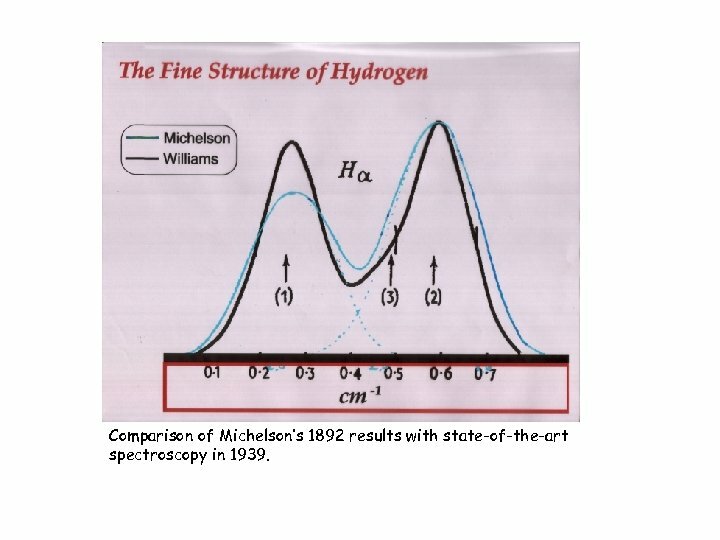 Michelson’s interferometric method was a) more precise- could measure one meter to about 1/100 of wavelength of light, ~2 parts in 10^8 b) more accurate- not susceptible to aging, temperature, bumps and bruises c) more practical- could be realized anywhere d) based on a natural unit. 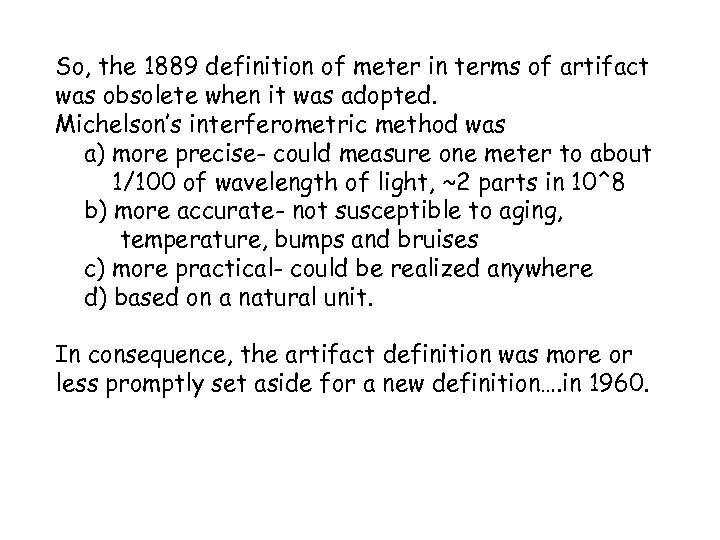 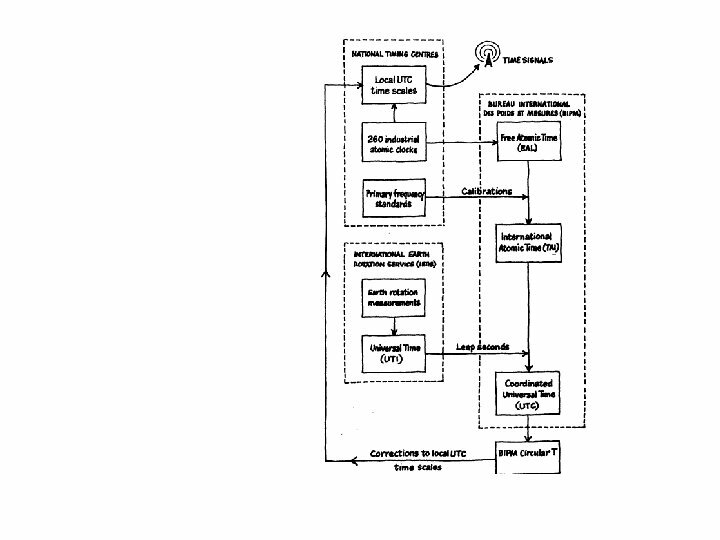 In consequence, the artifact definition was more or less promptly set aside for a new definition…. 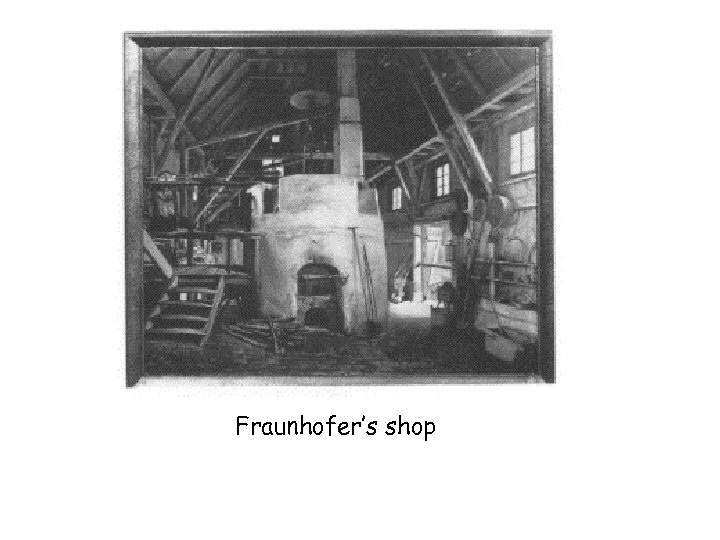 in 1960. 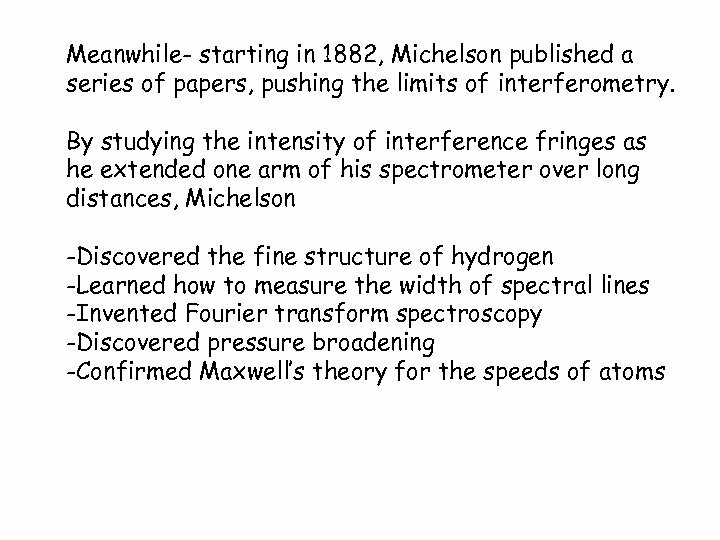 Comparison of Michelson’s 1892 results with state-of-the-art spectroscopy in 1939. 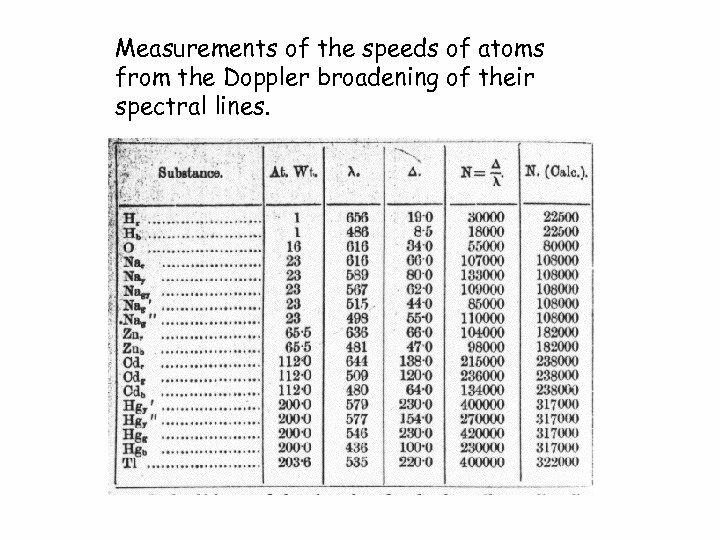 Measurements of the speeds of atoms from the Doppler broadening of their spectral lines. 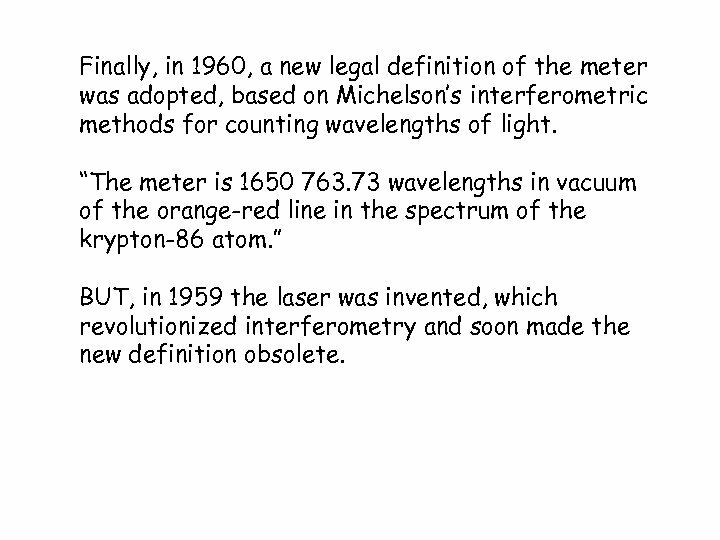 Finally, in 1960, a new legal definition of the meter was adopted, based on Michelson’s interferometric methods for counting wavelengths of light. 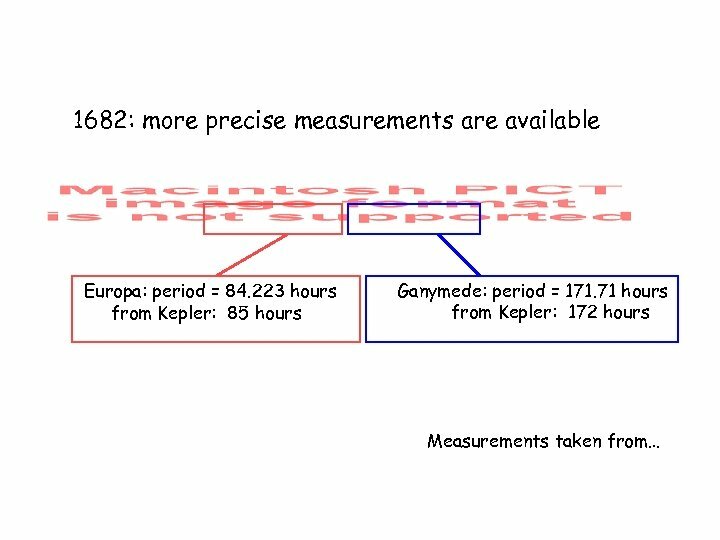 “The meter is 1650 763. 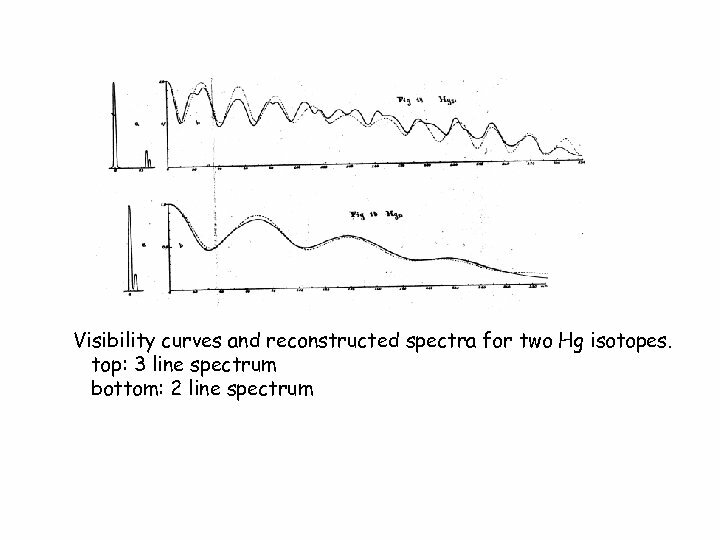 73 wavelengths in vacuum of the orange-red line in the spectrum of the krypton-86 atom. 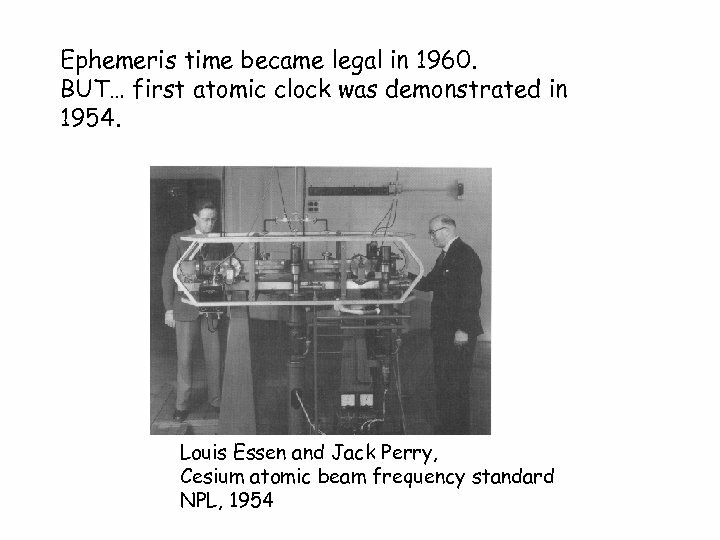 ” BUT, in 1959 the laser was invented, which revolutionized interferometry and soon made the new definition obsolete. 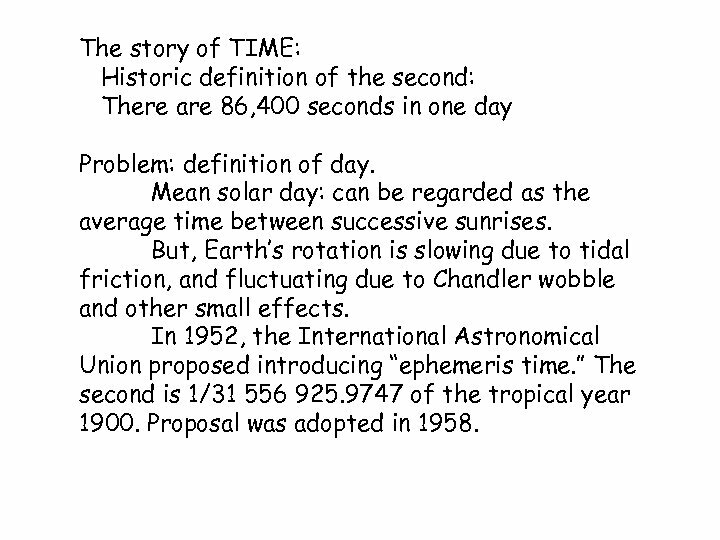 The story of TIME: Historic definition of the second: There are 86, 400 seconds in one day Problem: definition of day. 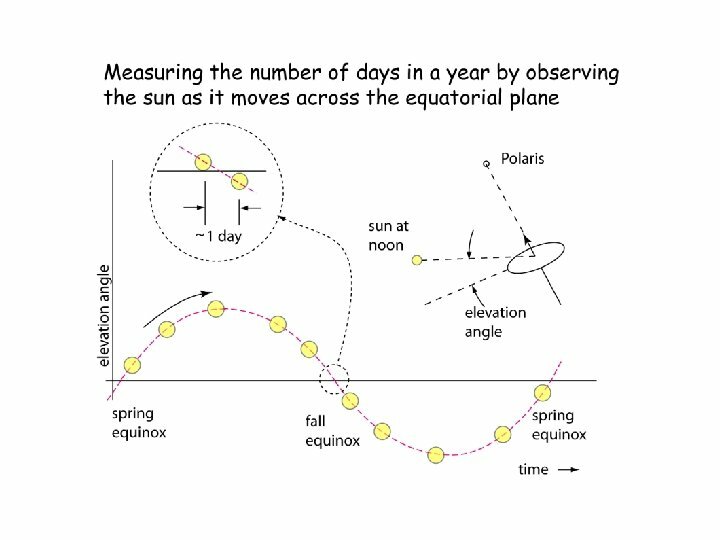 Mean solar day: can be regarded as the average time between successive sunrises. 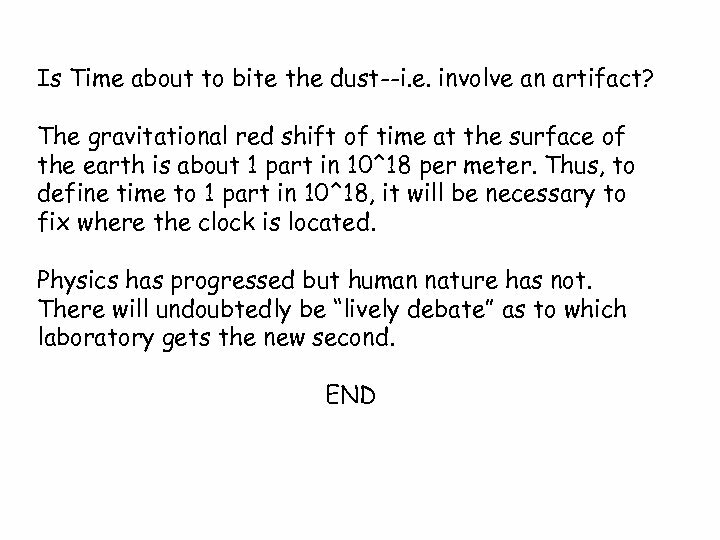 But, Earth’s rotation is slowing due to tidal friction, and fluctuating due to Chandler wobble and other small effects. 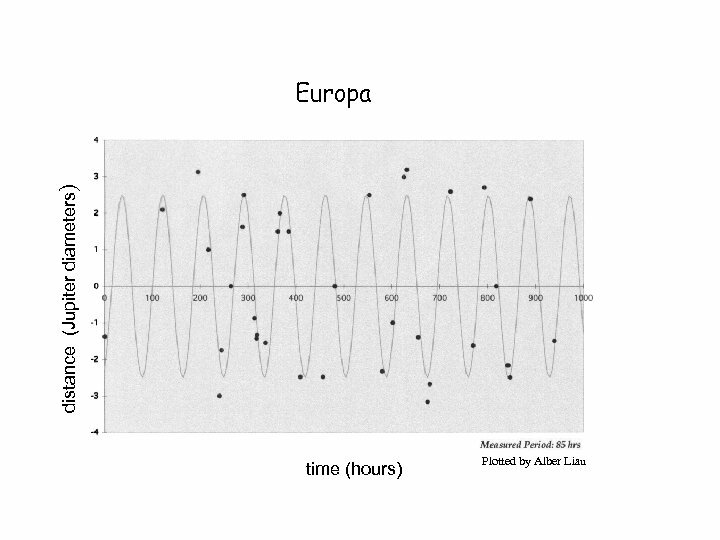 In 1952, the International Astronomical Union proposed introducing “ephemeris time. 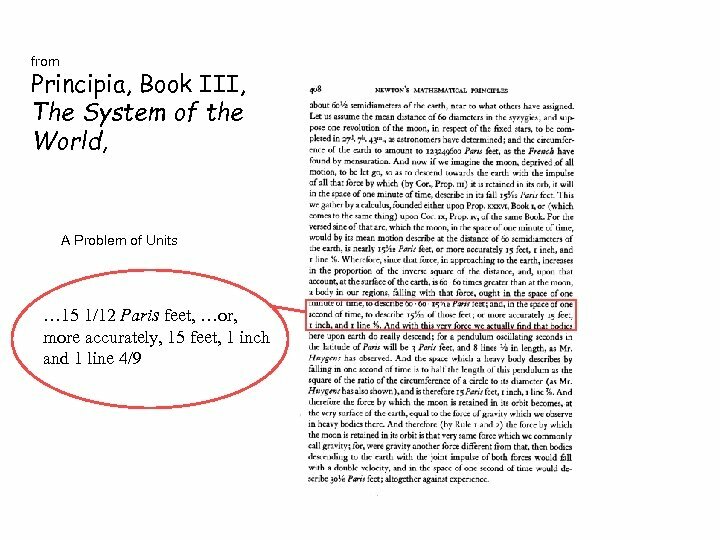 ” The second is 1/31 556 925. 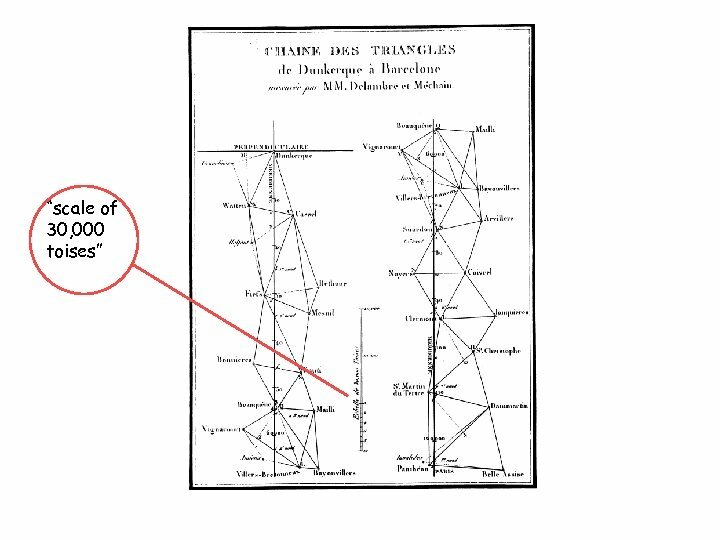 9747 of the tropical year 1900. 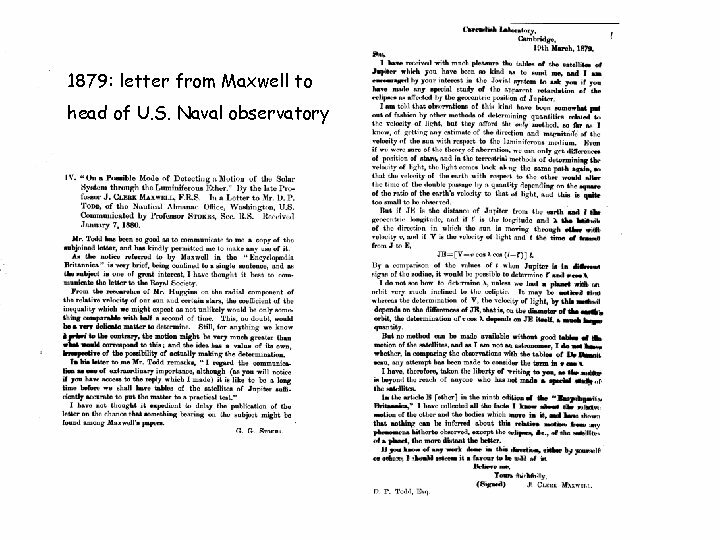 Proposal was adopted in 1958. 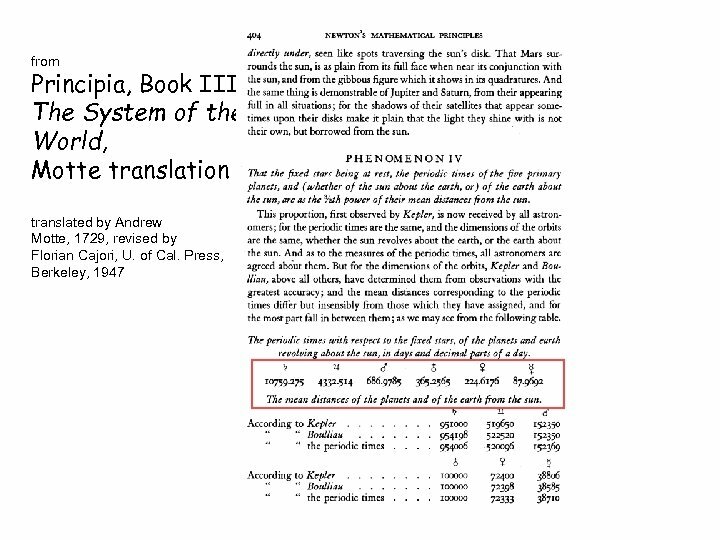 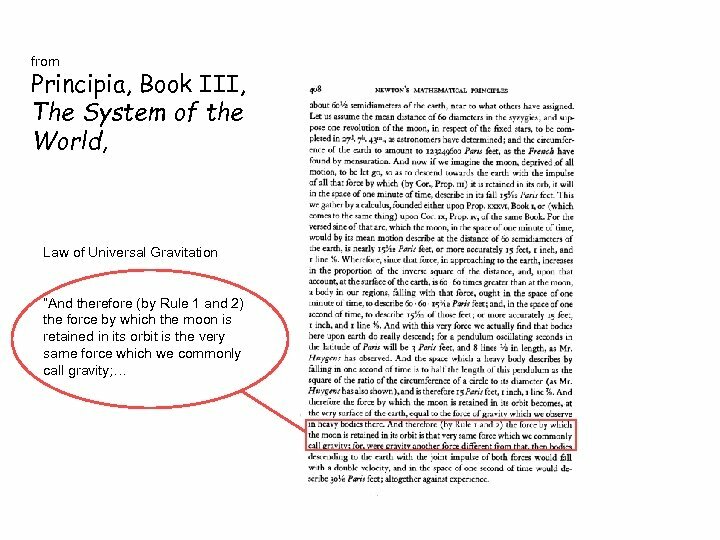 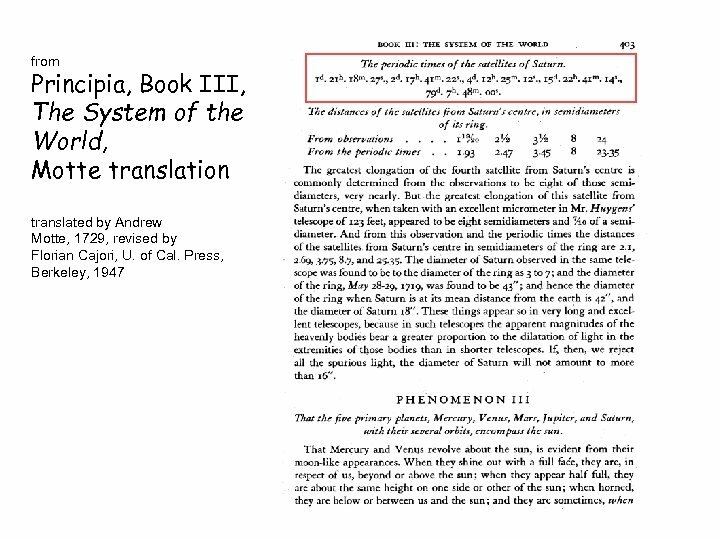 The definition of the second in terms of ephemeris time was obsolete before it was adopted. 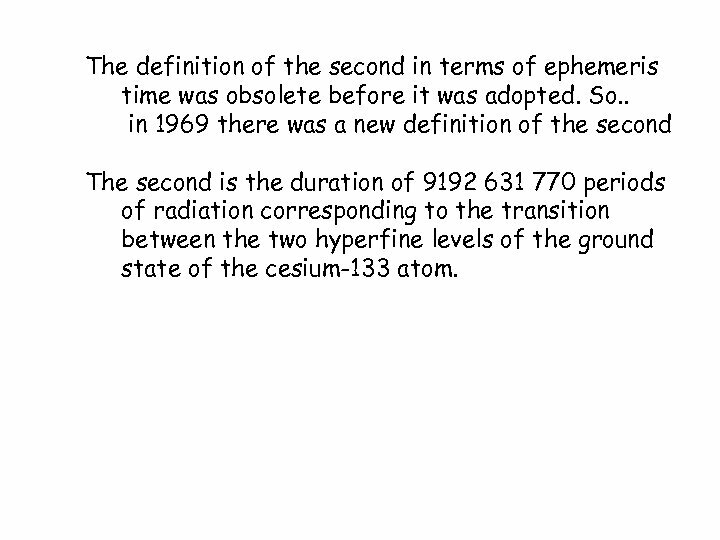 So. . in 1969 there was a new definition of the second The second is the duration of 9192 631 770 periods of radiation corresponding to the transition between the two hyperfine levels of the ground state of the cesium-133 atom. 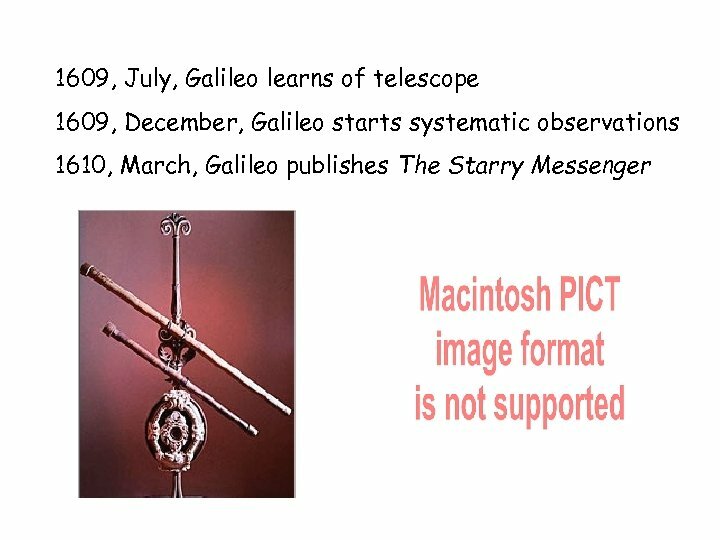 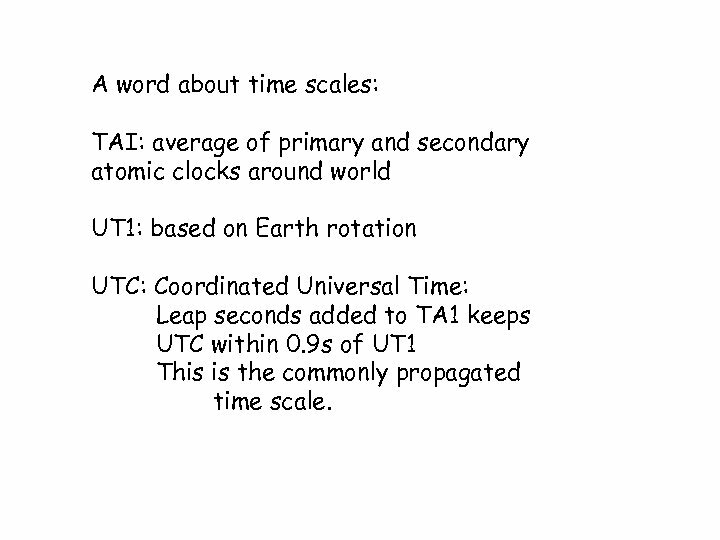 A word about time scales: TAI: average of primary and secondary atomic clocks around world UT 1: based on Earth rotation UTC: Coordinated Universal Time: Leap seconds added to TA 1 keeps UTC within 0. 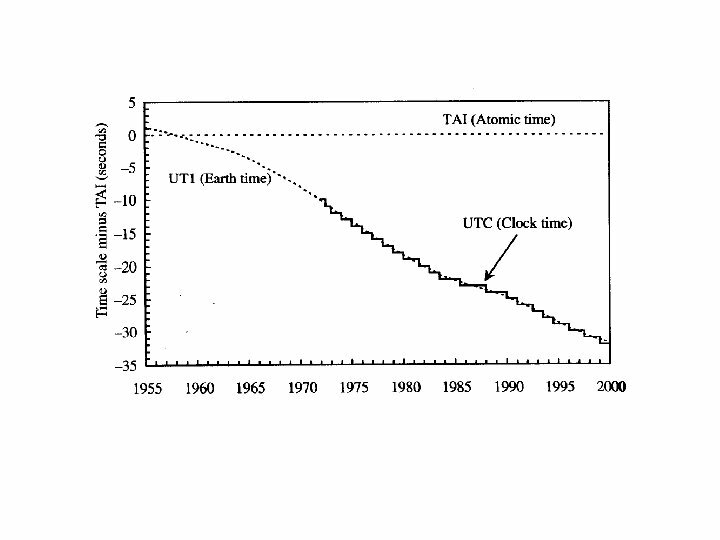 9 s of UT 1 This is the commonly propagated time scale. 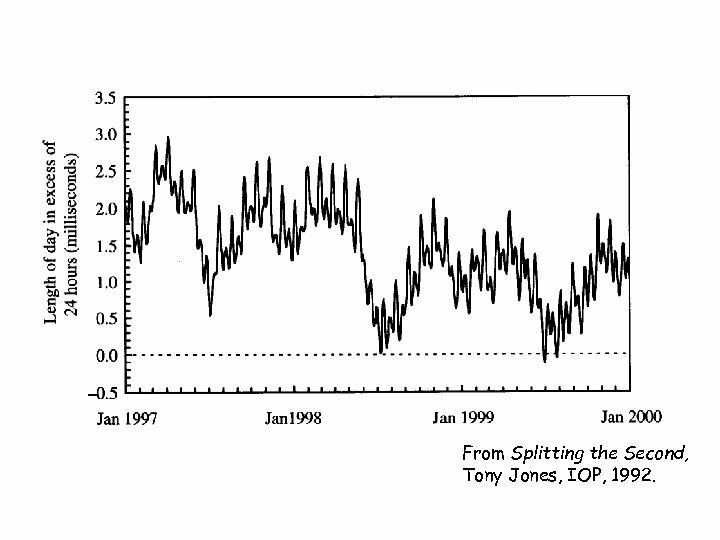 From Splitting the Second, Tony Jones, IOP, 1992. 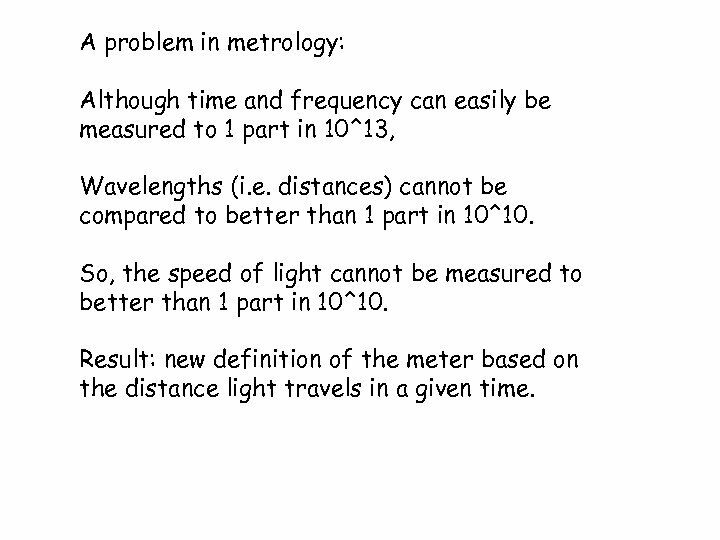 A problem in metrology: Although time and frequency can easily be measured to 1 part in 10^13, Wavelengths (i. e. distances) cannot be compared to better than 1 part in 10^10. 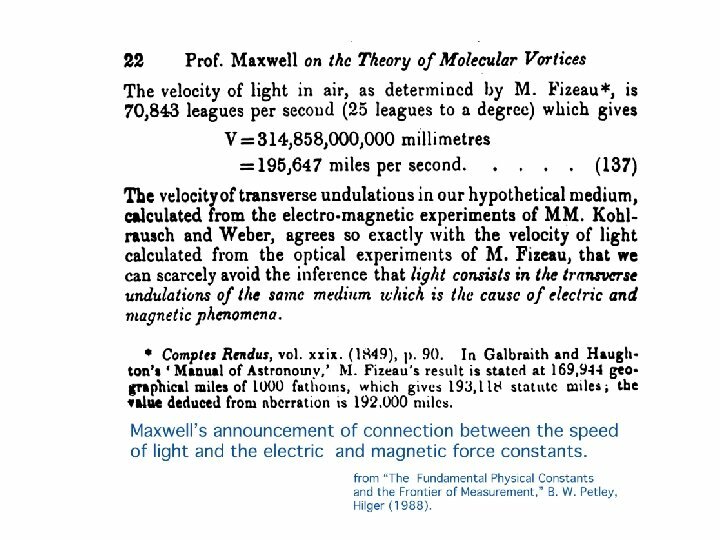 So, the speed of light cannot be measured to better than 1 part in 10^10. 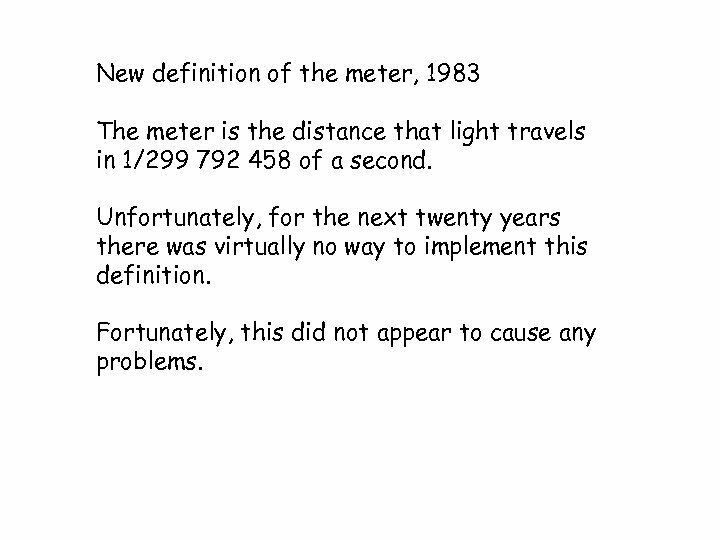 Result: new definition of the meter based on the distance light travels in a given time. 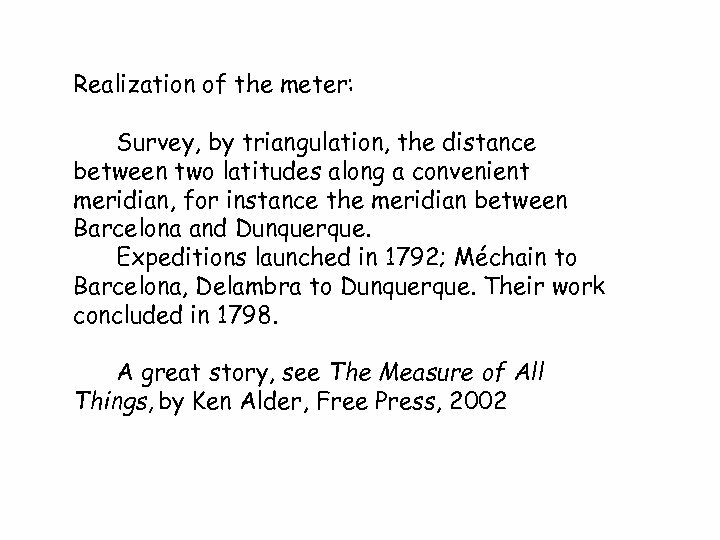 Realizing this new definition of the meter requires measuring the frequency of light, i. e. the frequency of a laser. 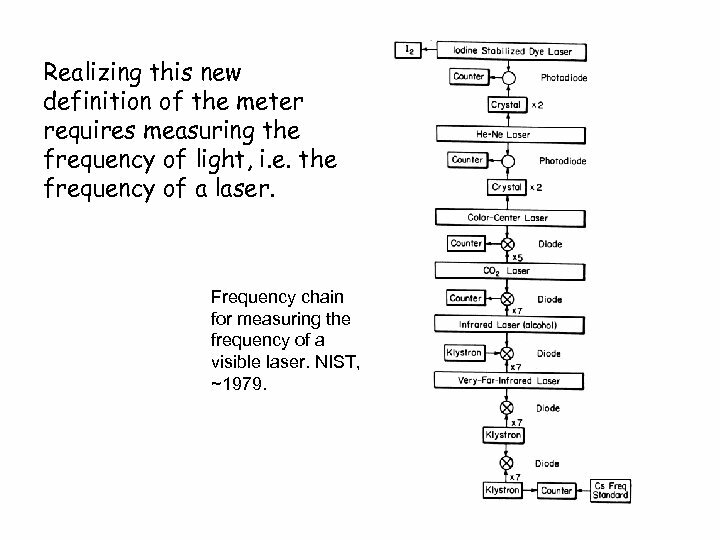 Frequency chain for measuring the frequency of a visible laser. 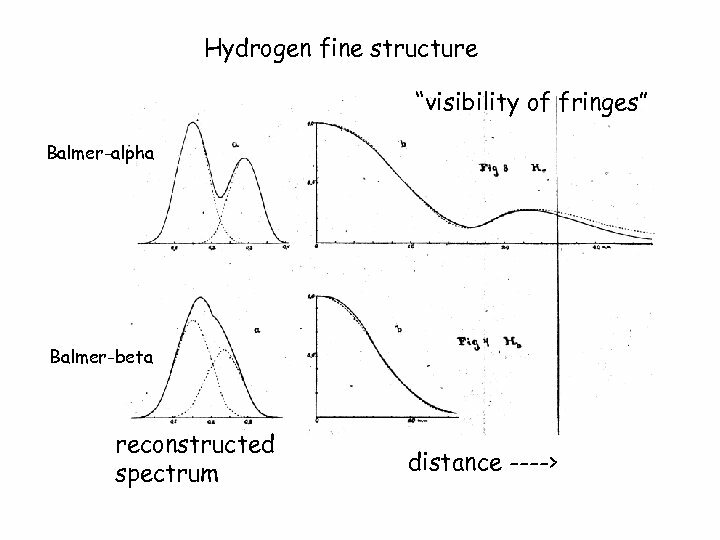 NIST, ~1979. 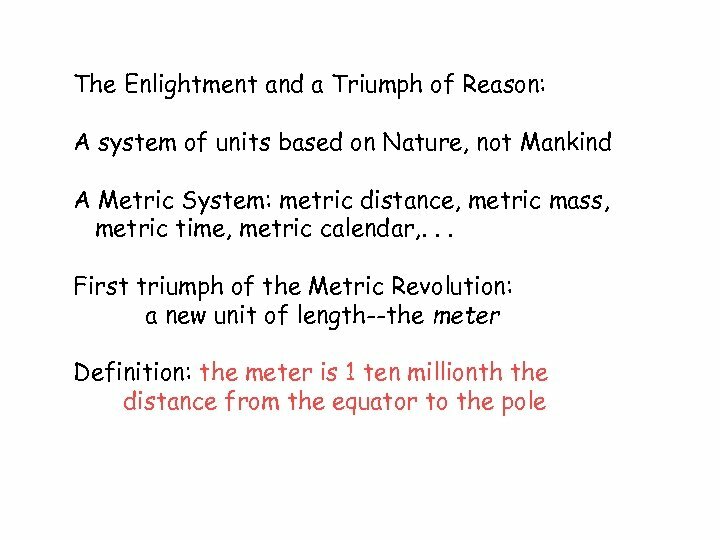 New definition of the meter, 1983 The meter is the distance that light travels in 1/299 792 458 of a second. 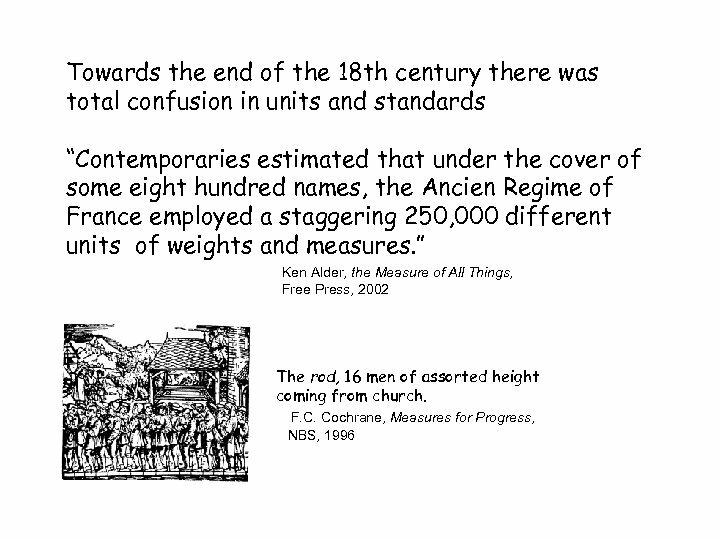 Unfortunately, for the next twenty years there was virtually no way to implement this definition. 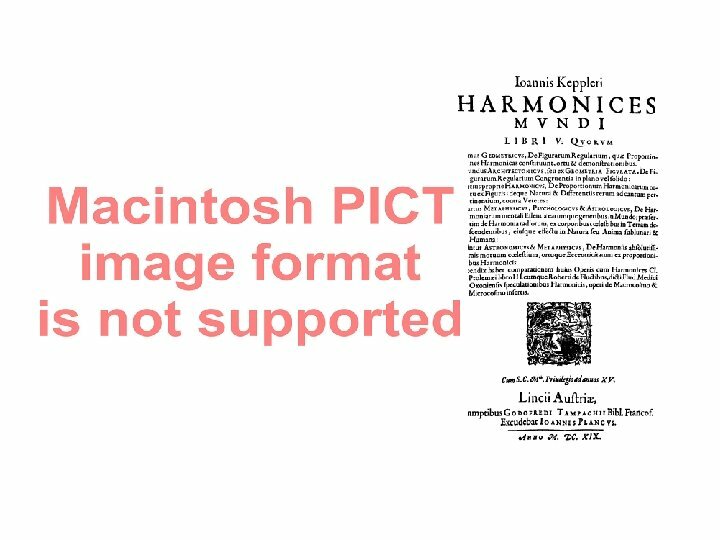 Fortunately, this did not appear to cause any problems. 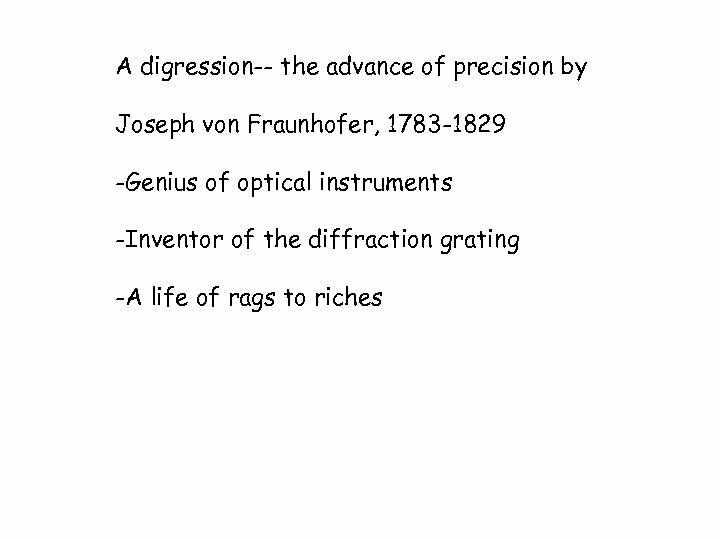 Changing styles of precision. 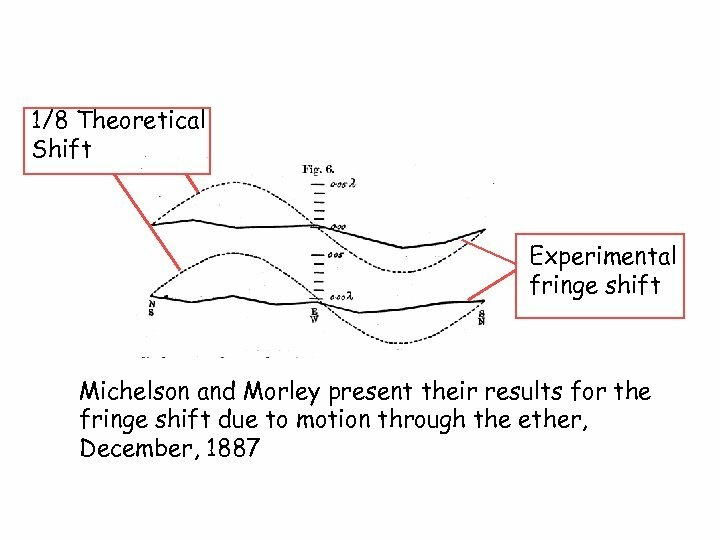 Three great syntheses in physics: -Newton: Law of Universal Gravitation -Maxwell: proof that light consists of electromagnetic waves, whose speed is given by the electric and magnetic force constants. 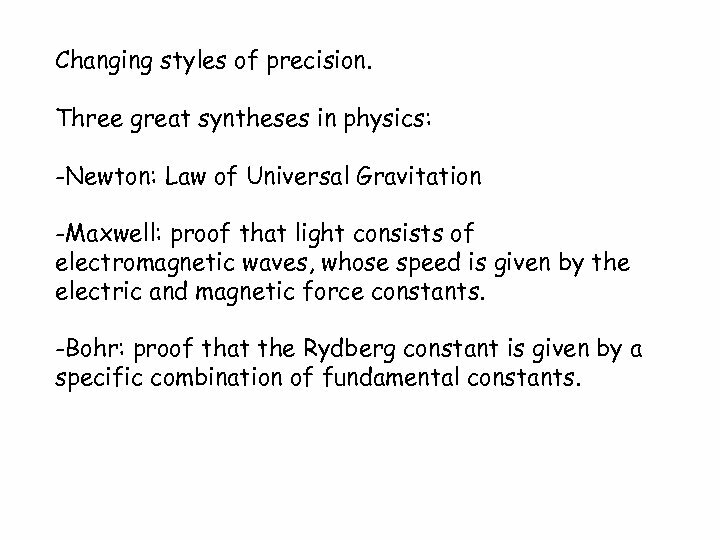 -Bohr: proof that the Rydberg constant is given by a specific combination of fundamental constants. 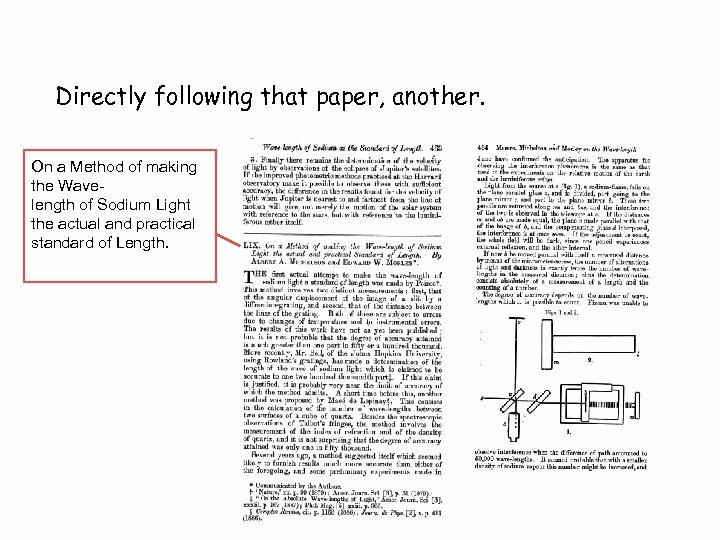 Bohr’s 1913 paper on his model of hydrogen. 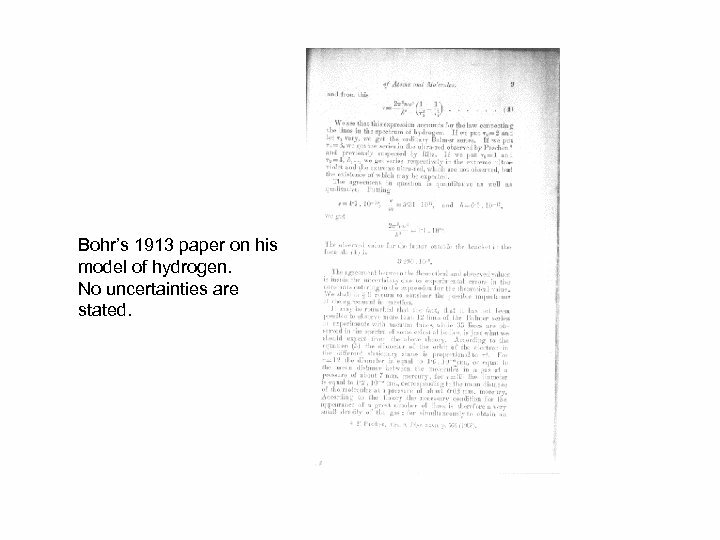 No uncertainties are stated. 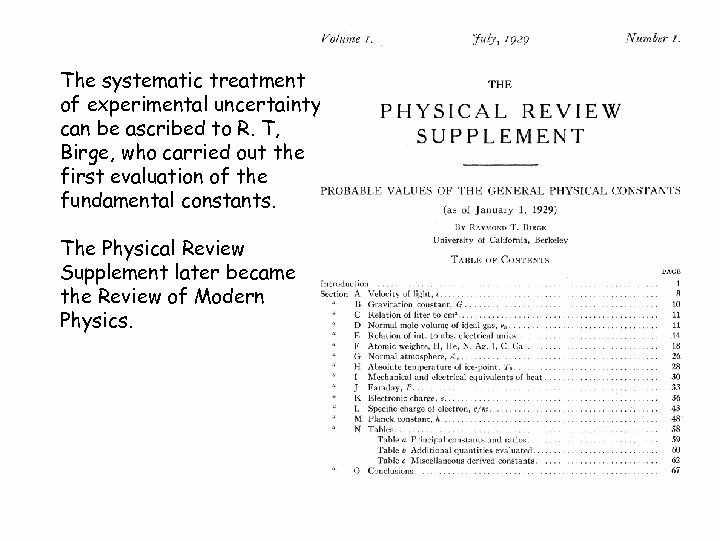 The systematic treatment of experimental uncertainty can be ascribed to R. T, Birge, who carried out the first evaluation of the fundamental constants. 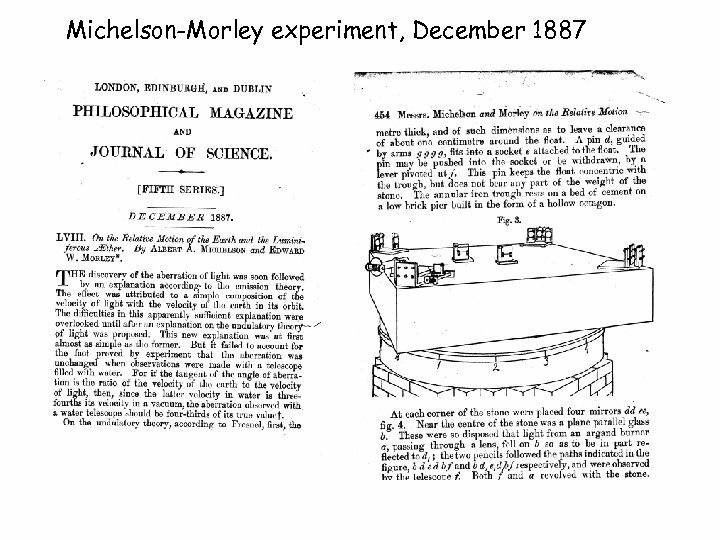 The Physical Review Supplement later became the Review of Modern Physics. 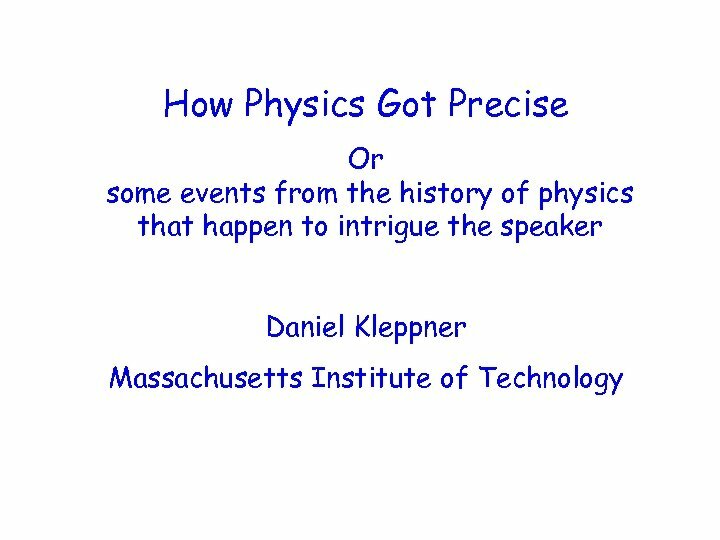 The current state of high precision The most accurately verified theory in physics is QED: theory and experiment have been found to agree to about 1 part in 10^11. 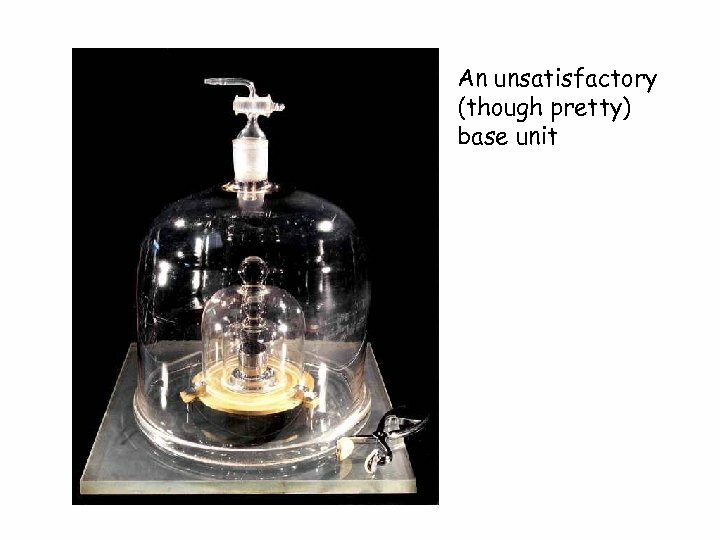 This will soon be improved significantly. 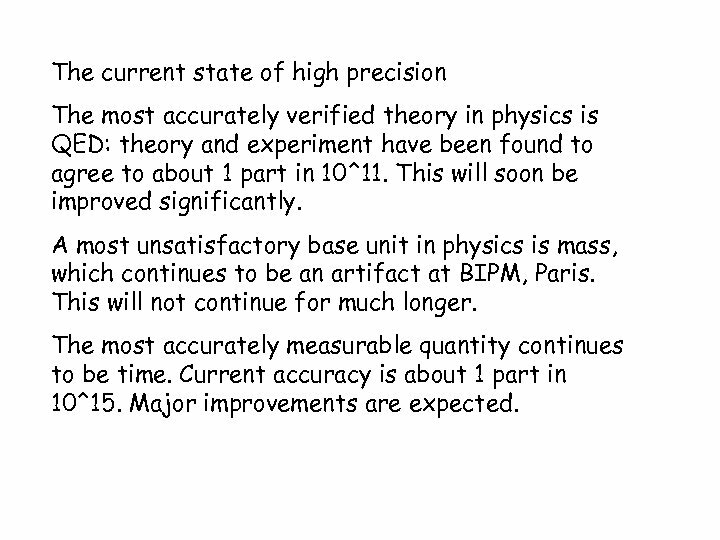 A most unsatisfactory base unit in physics is mass, which continues to be an artifact at BIPM, Paris. 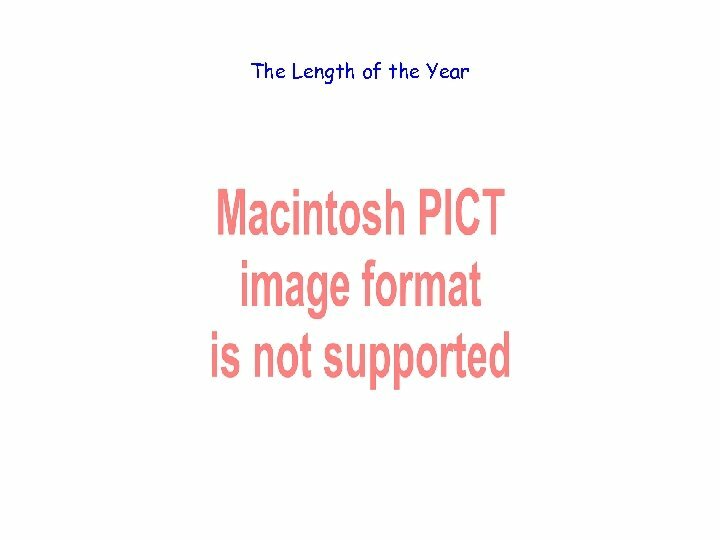 This will not continue for much longer. 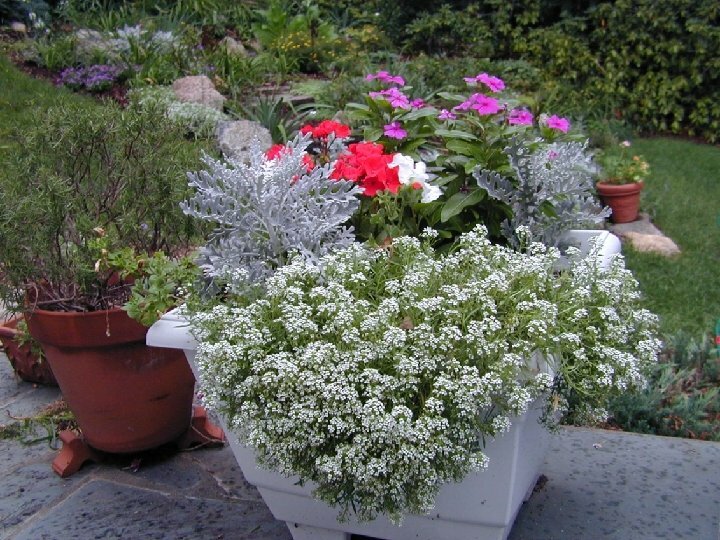 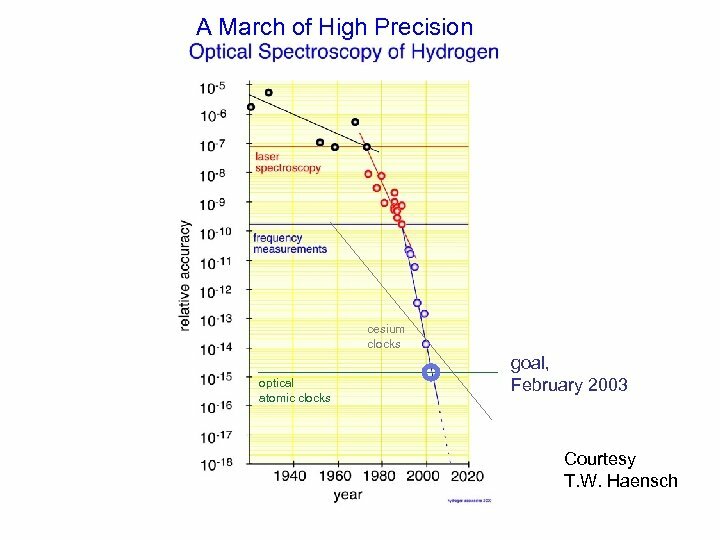 The most accurately measurable quantity continues to be time. 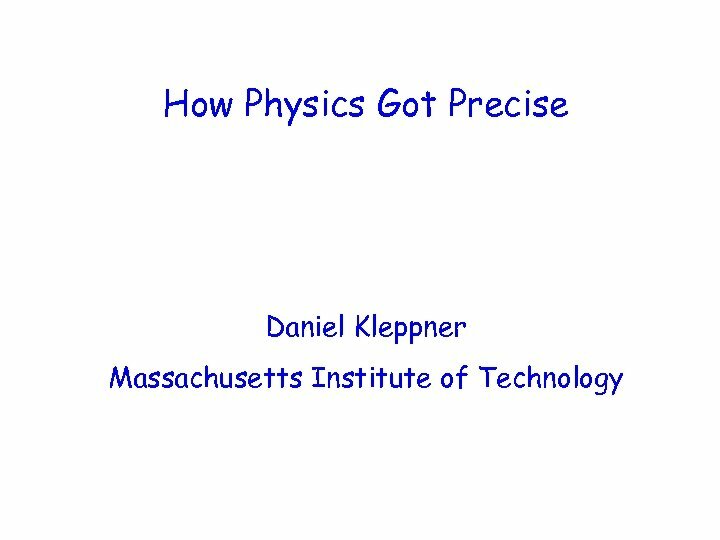 Current accuracy is about 1 part in 10^15. 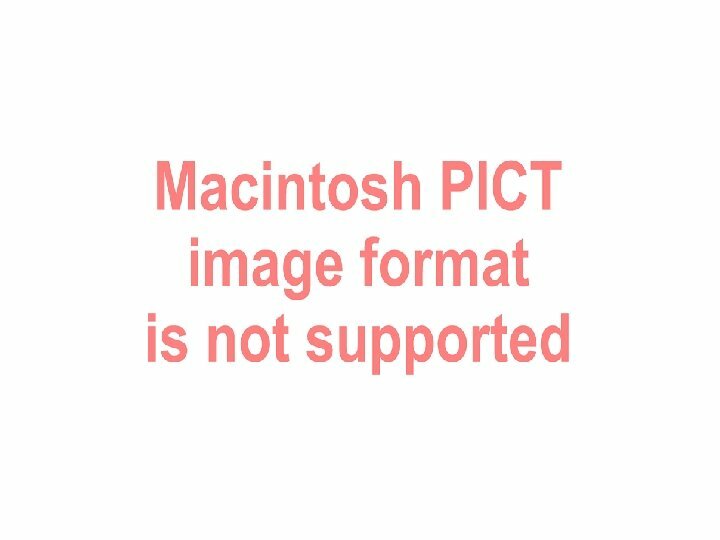 Major improvements are expected. 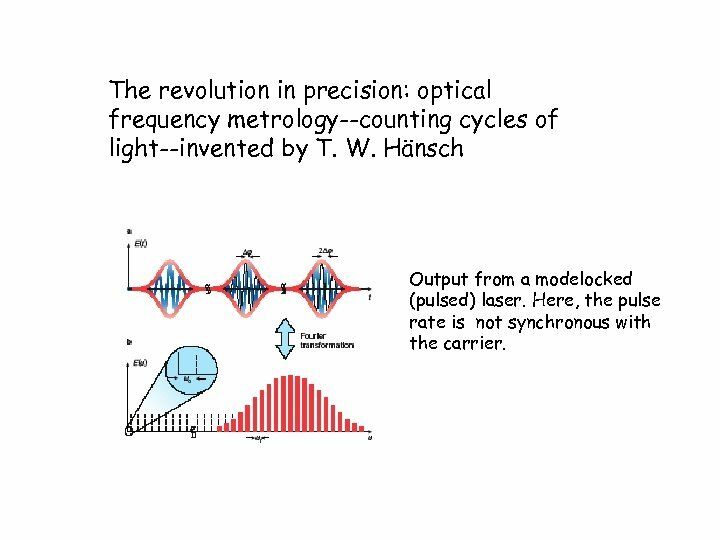 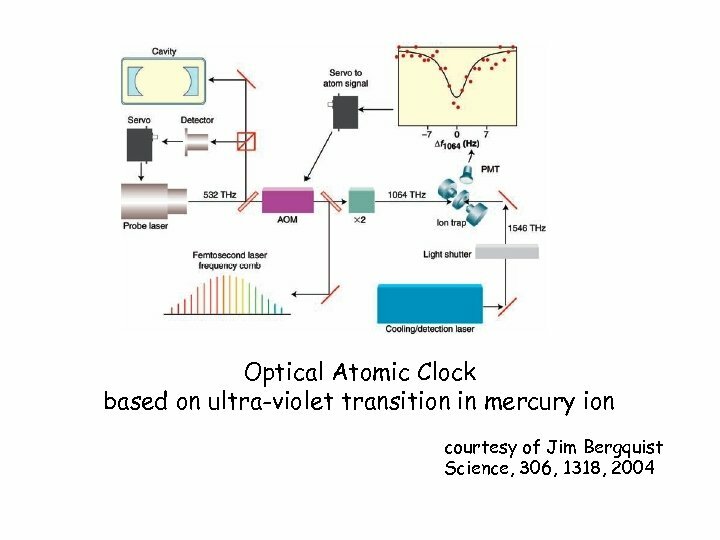 The revolution in precision: optical frequency metrology--counting cycles of light--invented by T. W. Hänsch Output from a modelocked (pulsed) laser. 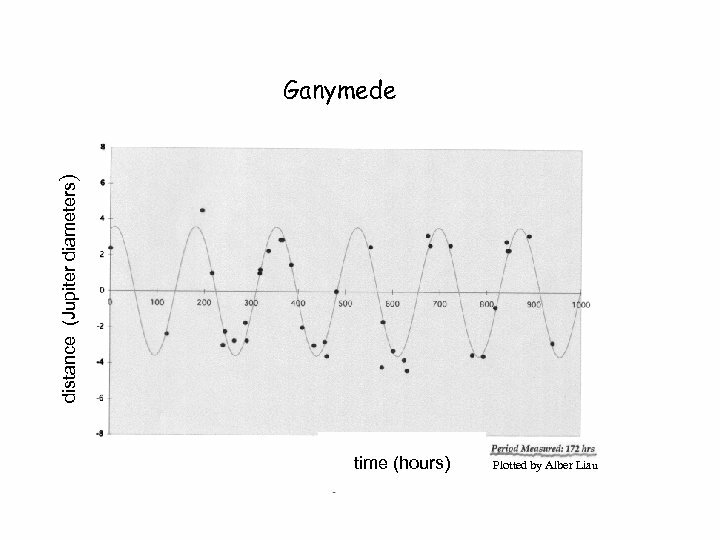 Here, the pulse rate is not synchronous with the carrier.